ANN ARBOR, Mich. — Shea Patterson had his best day running the ball and was pretty good at throwing it, too. Patterson accounted for 214 yards of offense and a touchdown, leading No. 12 Michigan to a 38-13 victory over No. 15 Wisconsin on Saturday night. The Wolverines called some plays designed for Patterson and that created problems for the Badgers. And sometimes, Patterson simply ran on his own after scrambling around. “It opens up a lot for your offense,” coach Jim Harbaugh said. With games coming up against rival Michigan State on the road and No. 8 at Penn State, no one in the maize and blue was in a mood to celebrate the big win over the Badgers. The Badgers (4-2, 2-1) had won a record 17 straight regular-season Big Ten games, and 10 consecutive road games in and out of conference play. “We certainly didn’t do enough things throughout the course of the game to give ourselves a chance to beat them,” Wisconsin coach Paul Chryst said. Patterson, who had an 81-yard run , scored on a 7-yard run and connected on a 2-point conversion pass to put Michigan up 21-7 early in the third. The possibly pivotal drive was extended when the Badgers were called for roughing snapper Camaron Cheeseman on a punt. “Those are the types of things when you do get a stop and then give the ball back to them, that makes it harder,” Chryst said. “Turnovers and penalties like that, you’re helping a good team and that makes it that much tougher. Michigan’s backup quarterback, Dylan McCaffrey, ran for a 44-yard TD to make it 38-7 with 5:16 remaining. Wisconsin’s Alex Hornibrook, meanwhile, had perhaps the worst game of his successful career. The senior was 7 of 20 for 100 yards with one touchdown pass with 3:47 left. He threw two interceptions, one of which was returned for a score by Lavert Hill that gave Michigan a 31-7 lead with 9:55 left to play. Wisconsin: The Badgers will have a hard time beating good teams if Hornibrook can’t make them respect the pass. Even if he can’t, though, Wisconsin may still end up representing the West Division in the Big Ten championship game. 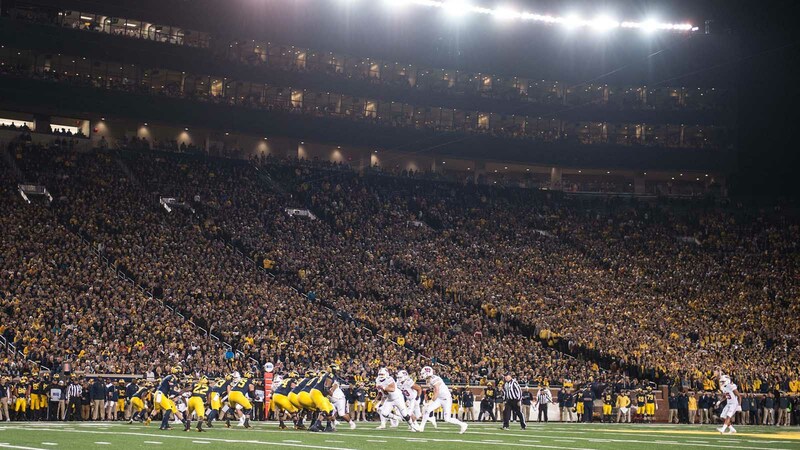 Michigan: The Wolverines earned their first impressive win of the season, but they can’t celebrate too much or too long with matchups coming up against the Spartans and Nittany Lions. Harbaugh didn’t sound concerned about his team’s ability to match Michigan State’s motivation to keep control of the series. “We’ll be really intense for it,” Harbaugh said. Michigan ranked No. 120, out of 129 teams, entering the game with 52 penalties. It was flagged only once against Wisconsin, getting an unsportsmanlike conduct for celebrating Hill’s interception return for a touchdown. Wolverines defensive end Rashan Gary didn’t play due to his injured right shoulder. Wisconsin safety D’Cota Dixon missed the game because of a foot injury. Michigan: Plays at Michigan State, which has won eight of the last 10 games in the rivalry and is coming off a win against Penn State on the road. “We’ve got a big stretch in the schedule here and we’re ready for it,” guard Ben Bredeson said.